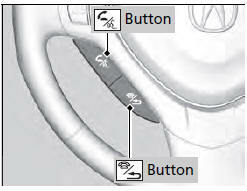 Press the (HFL Talk) button on the steering wheel to receive a call when Bluetooth® Audio is playing. Press the (HFL Back) button to end the call and return to Bluetooth® Audio. If you receive a call while Bluetooth® Audio is in the Button pause mode, it will resume play after ending the call.